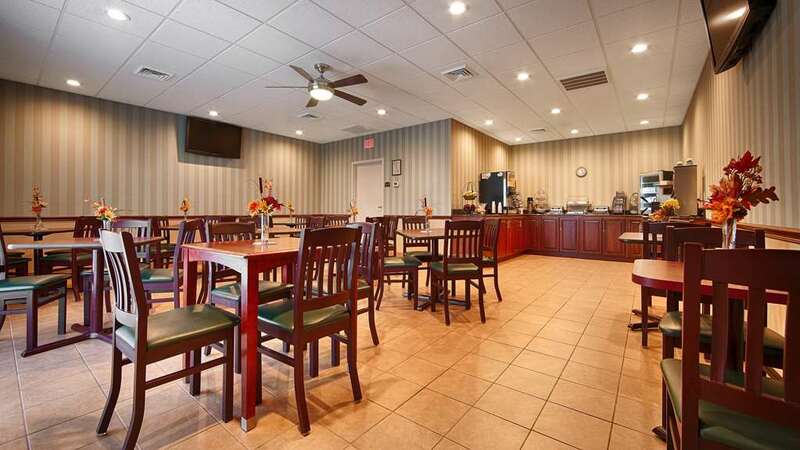 The Best Western Staunton Inn, situated in the breathtaking Shenandoah Valley, this Staunton, Virginia area hotel features all the amenities and comfort guests have come to expect from the Best Western brand, in addition to affordable rates and a convenient location off I-81. Outside the Best Western Staunton Inn, guests will discover an entire city at their fingertips. From exploring history at the Frontier Culture Museum to scenic drives on the Blue Ridge Parkway and fantastic performances at the American Shakespeare Center, there's something for everyone in Staunton. Shenandoah National Park is also close by for outdoor enthusiasts to enjoy, and Mary Baldwin College is just a short drive away, which makes this hotel perfect for families visiting students and touring campus. Guests of the pet-friendly Best Western Staunton Inn will appreciate each well-appointed guest room, which all come complete with cable satellite television and free high-speed internet access. Rooms on the third and fourth floor have been reserved specifically for guests who are allergic to pets. Please request this room type when making your reservation or at check-in. Many rooms with two double beds face train tracks. You can request rooms on the other side of the hotel. Other amenities at this Staunton hotel also include a complimentary deluxe continental breakfast and an indoor heated swimming pool. Guests can also eat at the Rowe's Family Restaurant and Cracker Barrel Restaurant - both located adjacent to the Best Western Staunton Inn. Business guests of the Best Western Staunton Inn will also appreciate the hotel's quiet surroundings and close proximity to local businesses, including McQuay International, McKee Foods , Target Corporation and Hershey Foods of Virginia. If you are planning to stay at the best and friendliest hotel in Staunton VA, book your stay at the Best Western Staunton Inn today. From: The north. Take Interstate 81 to Exit 222. Turn left onto US Route 250 East. The Best Western Staunton Inn is located on the right. From: The south. Take Interstate 81 to Exit 222. Turn left onto US Route 250 East. The Best Western Staunton Inn is located on the right. From: The east. Take Interstate 64 West to Interstate 81 North to Exit 222 Turn left onto US 250 East. The Best Western Staunton Inn is located on the right. From: The west. Take Interstate 64 East to Interstate 81 North to Exit 222 Turn left onto US 250 East. The Best Western Staunton Inn is located on the right.